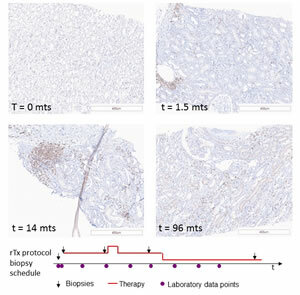 The overarching goal of the SYSIMIT projects is to exploit the full prognostic potential of routinely obtained biopsy samples in transplantation and hereditary breast cancer. 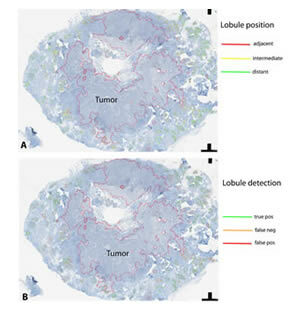 Compared to conventional “descriptive” evaluation of biopsies, the fundamentally new approach is including the spatio-temporal dimension of dynamic immunological processes in the interpretation of microscopic image data, based on advanced image analysis and mathematical models of underlying dynamic processes. SYSIMIT realizes a systems medicine approach by integrating image mining approaches adopted from satellite-based remote-sensing image analysis technologies, three-dimensional simulations of cell-cell interactions, and comprehensive integrative analysis of multimodal biomedical data such as genome-wide molecular data and autoantibody profiles, in a consequently interdisciplinary effort. Example for consecutive biopsies at different time points (in months, mts) after renal transplantation. The four microscopic images show immunohistochemical detection of CD3, a T-lymphocyte- specific surface marker. Biopsies can be performed for a clinical indication ("indicated biopsies"), or as protocol biopsies in the context of planned follow-up examinations. 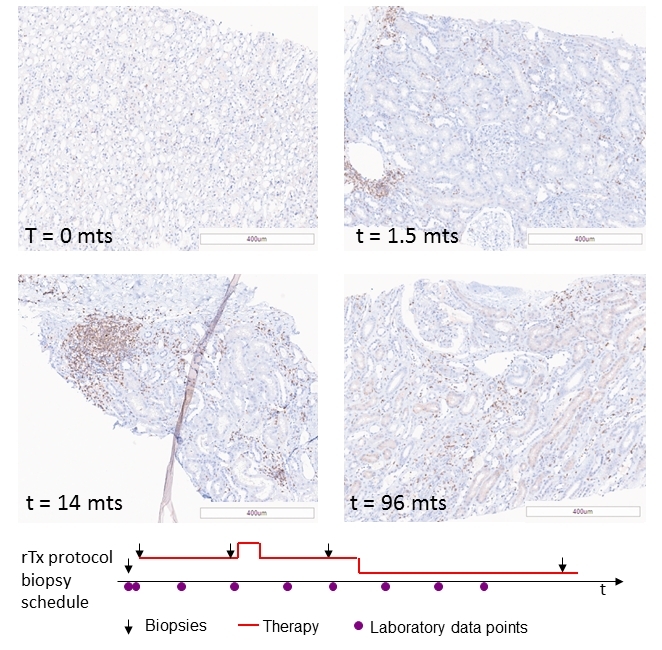 The schematic under the images shows a fictive possible time course of protocol biopsies. SYSIMIT follows a disease-overarching concept. The two very different areas of renal transplantation and breast cancer share one important commonality: Protein structures that are recognized as “foreign” by the patient’s immune system persist for a long time and induce a microscopically detectable immune reaction, so far not sufficiently captured by conventional methods. In the case of breast cancer, the inflammatory reactions have even been regarded as “bystander” effect rather than as element reflecting tumor phenotype. We expect that advanced pattern recognition in the framework of our systems medicine approach will significantly improve the diagnostic and predictive value of routinely obtained biopsies, particularly in the context of novel targeted immunomodulatory therapies. 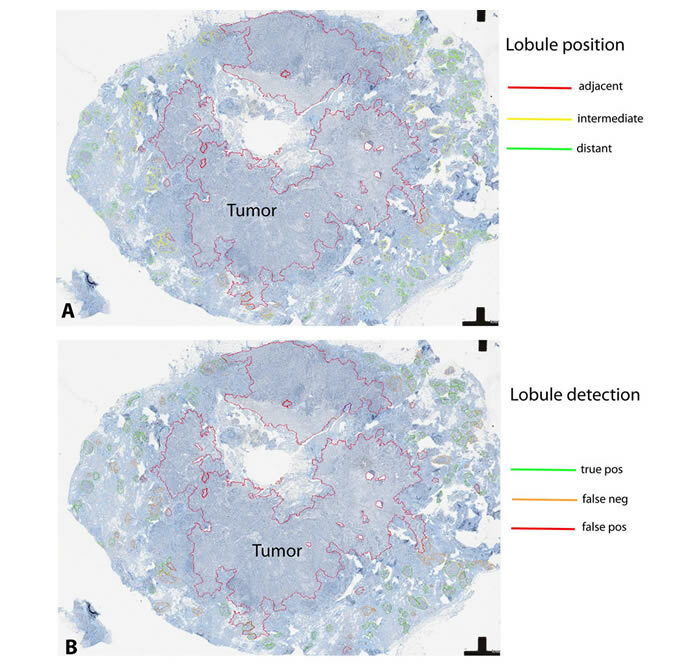 Prerequisites to capture the spatial aspects of the breast cancer -associated inflammatory resonse in the tumor microenvironment: Object-oriented image analysis to detect mammary gland lobules adjacent to hereditary breast cancer. A - classification of lobules according to their distance to the tumor. B - An important tool for for statistical assessment of sensitivity and robustness of automated pattern recognition, in this example by manual annotation of true positive, false positive, and false negative results. To this end, there has been a recent paradigm shift in oncoimmunology, towards recognizing the inflammatory tumor microenvironment in certain cancer types as targetable, intrisic component contributing to the biological behavior. In transplantation medicine, an ongoing discussion is on the role of the antibody-mediated “humoral” component of acute rejection, positioning our study of early lymphoid structures that potentially preceed the generation of donor-specific antibodies, in a clinically relevant field of interest. Thus, SYSIMIT is in line with the overarching goal of the e:Med initiative to establish systems medicine in Germany in disease-related areas, and to use its innovative strategies to enable substantial improvements in fields with an urgent medical need.